Dear God, it's been 20 years since "Digsy's Diner"! Back then, that tune was thought of as a "throwaway track" from Definitely Maybe but, hey, it gave me a good title for this blog post, eh? I'm here to tell you that the first album by Oasis has been reissued in a deluxe 3-CD set. Details on that are here. If you don't already have and love this record, then nothing I can write can make that happen for you. 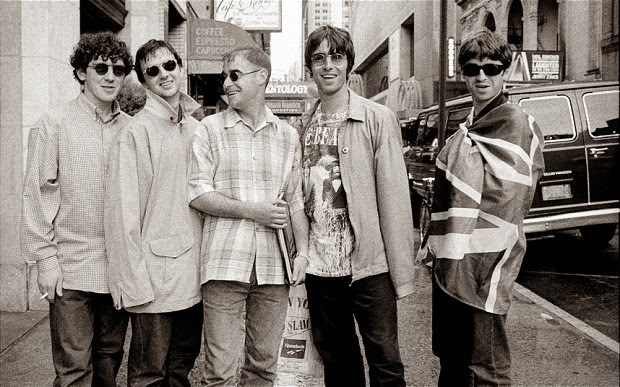 And if you don't like Oasis, then I really have nothing more to say. That said, I didn't necessarily buy the hype either back in 1994. You have to remember that Creation Records meant one sort of thing prior to Oasis. In fact, "Supersonic" was downright shocking to me when I first heard it. Somehow I couldn't wrap my head around how these Manc thugs were on the same label as My Bloody Valentine. Decidedly un-jangle-y, Oasis were rough and full of big tunes. They were not shoegazers or guys trying to dress like Lou Reed in the Velvet Underground. They raved about the Beatles in interviews and roared like Slade in the hooks of the songs. They were decidedly populist. I'm not going to be all revisionist here and say how much I loved Definitely Maybe when it came out. I saw the posters up at Vinyl Ink in Silver Spring where I'd used to go to buy Creation Records import CD singles. This was in the era when guys from Slumberland Records bands -- and head honcho Mike Schulman -- still worked there from time to time. The Oasis posters didn't do it for me. Nothing in the imagery made me want to hear the band. When I finally heard Definitely Maybe I liked stuff like "Up in the Sky" and "Cigarettes & Alcohol" more than other tracks on the record...more than all the other tracks but one. As that overwhelming British music press hype rolled on in 1994, I had to stop and admit that "Live Forever" was a heart-stoppingly magnificent single. It was a slice of genius. Whoever this lout singing was, he was un-loutish enough to pause mid-swagger to think of his own mortality. 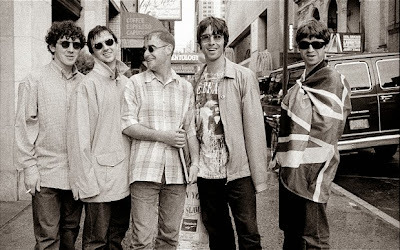 And that mix of bravado and introspection is something that few others could master like Oasis did on these early cuts and it's the reason why that song remains one of my favorite singles of all time even now, 20 years after the release of Definitely Maybe. So what's here? The full album is on Disc 1. The B-Sides, many of them fantastic and familiar, and "Whatever" are on Disc 2. And Disc 3 is where the rarities are. There's the Charlatans-like "Cloudburst" (demo) and the rare "Strange Thing" (demo) which sounds remarkably like some odd combo of Soup Dragons (baggy era, not C86-era) and Teenage Fanclub. A fave of mine is the raw and fuzzy demo of "Fade Away", the blueprint for everything Gem Archer tried to do in Heavy Stereo before joined Oasis. So should you buy this album again? Do you need another version of Definitely Maybe and all those B-sides in your collection again? Is Disc 3 really so good that you need to buy this set? So there's loads of stuff here that will provide some additional pleasures to any fan of this classic record. 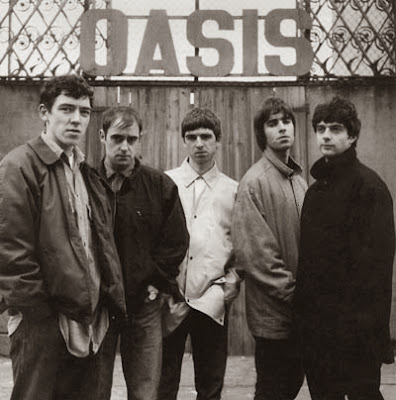 For Oasis were the whole package. If you only know the album cuts, you only know half the band's best stuff. Those B-Sides are exceptional and even their Demos are good. I tend to think that Liam's vocals are a large part of the success that Oasis achieved but, really, it's the genius of Noel Gallagher that is here on this 3-disc anniversary edition of Definitely Maybe. The B-Sides and Demos reveal that.